different taste for the kuruma and it can be used for idli and dosa also. 1. Remove the skin of the onion and wash them. Then cut them into small pieces. 3. Wash and chop the coriander leaves into very small pieces. 4. Wash and soak the black chana for overnight. Again wash the chana and pressure cook with enough water for 3-4 whistles in a medium flame. 5. 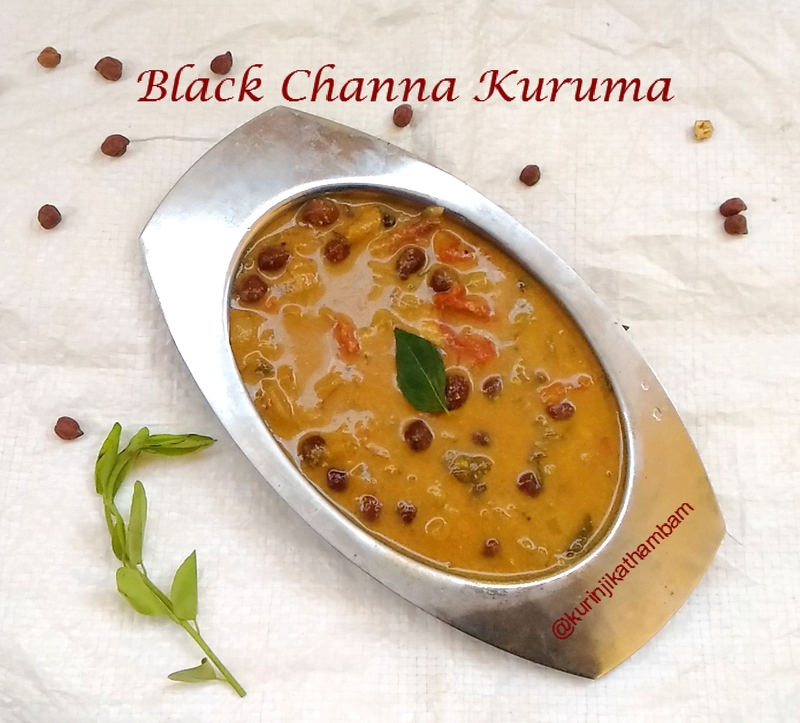 After pressure has gone, transfer the cooked chana into a bowl. 6. Meanwhile, grind the coconut, aniseeds, poppy seeds and roasted split gram into a fine paste with little water. Keep it aside. 7. Heat the oil in a pressure cooker, add mustard seeds and wait for popping. Then add the bay leaf and curry leaves. Sauté till the leaves becomes crisp. 8. Then add the chopped onion (from 1) and sauté till the onion becomes transparent. 9. 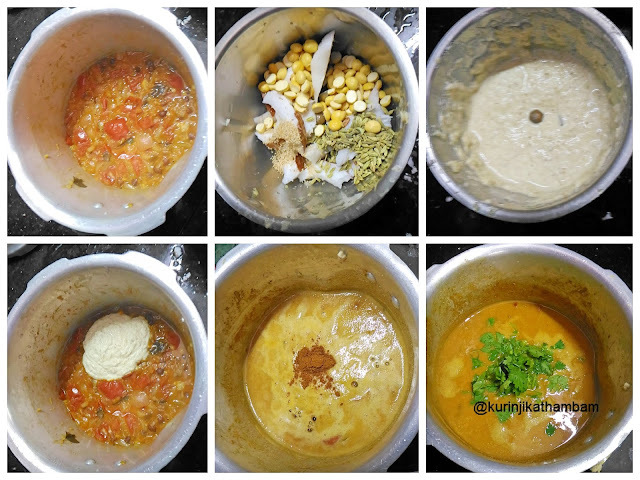 Now add the chopped tomatoes (from 2) and fry till the tomatoes become mushy. 10. 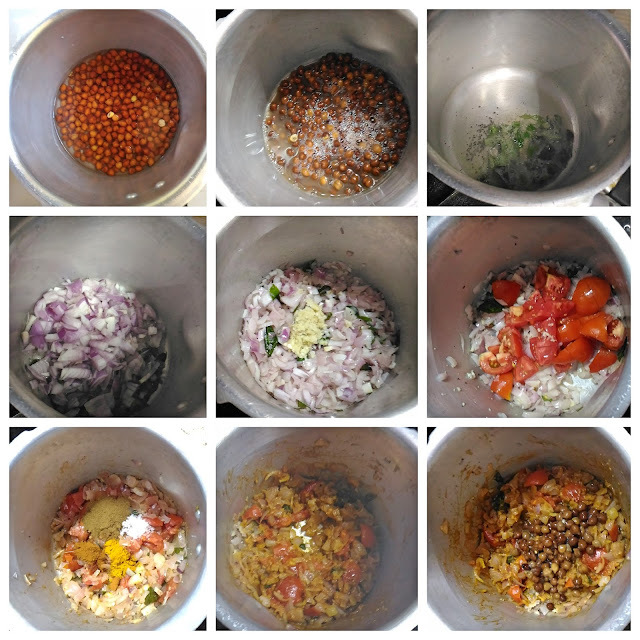 Add cooked chana ( from 4), turmeric powder, red chilly powder, coriander powder and salt. Mix them well and fry for 2 mins. 11. Now add the ground paste (from 9), garam masala and required water, mix them well and pressure cook for 1 whistle in high flame. Then switch off the flame and allow it to cool down. Yummy and delicious kuruma is ready to serve with roti and dosai. 1. Adjust the water level according to your requirement. Because for rotis we want the kuruma to be little bit thicker than dosai. Click here for side dish recipes.